This is a mixed media oil painting with collage elements in the underpainting. It is from my floral series, but also ties in with my Travel Journal series of paintings. There is a lot of interesting elements included like gold leaf, script, St. Peters Dome and many other hidden surprises. This painting sold however I love doing commissions for people that incorporate ideas and memoirs from their own travels. This was painted on canvas, and the size is 48" x 24". I really like the colors and textures in this one. I also like your inclusion of architecture. 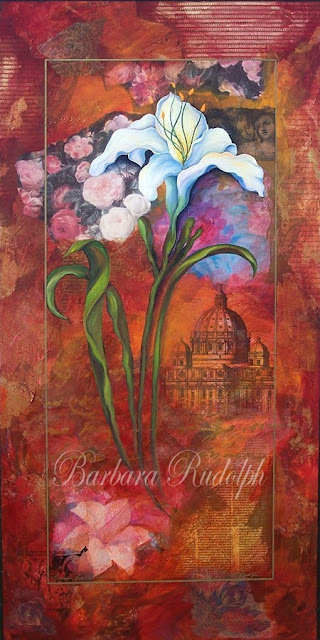 FLORAL SERIES - "Lily of the Valley"
FLORAL SERIES - "Peony On Gold"
Bird Series - "Happy Thanksgiving"
Travel Journal "Torso of Aphrodite"
Travel Journal Series - "Poste Vaticane"
Old World style painting "Classical Dance"
TRAVEL JOURNAL SERIES - "Venus"